The Bold and the Beautiful (B&B) spoilers for Wednesday, December 5, tease that Donna (Jennifer Gareis) will enjoy growing closer to Eric (John McCook). She was hesitant to get in on that modeling session at first, but bonding with Eric will make the task worth it. Donna still has some lingering love, which Pam (Alley Mills) is exploiting for her scheme against Quinn (Rena Sofer). While Donna continues to work her magic, Pam will have another goal to accomplish. She’ll try to keep Quinn away from Eric and Donna for as long as possible. Pam wants to give Donna all the time she needs to show Eric they still have chemistry. She knows Eric won’t fall madly in love again over one modeling session, but it could be a step in the right direction. Of course, Quinn’s bound to be suspicious when Pam corners her. B&B spoilers say Pam will push a ridiculous distraction, so that should really raise red flags. Quinn doesn’t trust Pam anyway, which is why she’s always expecting a scheme. It’s a wise expectation to have at the moment. Pam’s indeed plotting to destroy Quinn and Eric’s marriage, so Quinn has to keep her guard up. 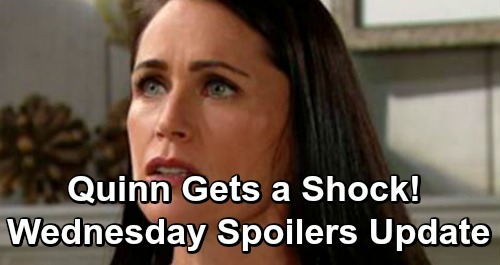 The Bold and the Beautiful spoilers say Quinn will make a shocking discovery later. Whether she catches Donna modeling or finds out about it afterward, Quinn is sure to hit the roof. She may scold Eric for letting Donna so blatantly flirt. However, Eric won’t see why this has to be a big deal. He’ll remind Quinn that he’s in love with her and argue that friendship is all he wants from Donna. Something tells us Quinn won’t believe that! Since Pam and Donna are actively plotting Quinn’s downfall, she has every reason to fight back. The Bold and the Beautiful spoilers say Quinn will do just that in the coming weeks, but any move that crosses the line could cost her. In the meantime, Bill (Don Diamont) will confide in Brooke (Katherine Kelly Lang). After she confronts him about Taylor (Hunter Tylo), Bill will talk about why he didn’t turn her in for the shooting. He’ll confess that Brooke affected his heart. Bill will reiterate that he’s trying to be a better man, so he felt like showing mercy was appropriate. He was trying to turn from his vengeful ways for Brooke’s sake. Naturally, Brooke will have mixed feelings about Bill’s admission. Part of her will be grateful that Bill isn’t as vindictive these days. Another part of her will still think Taylor needs to be locked up. Bill will do his best to settle Brooke down and make her an official part of the secret circle. He’ll feel like they have to keep their mouths shut and move on. Will Brooke be able to stay quiet indefinitely? What about Bill and the others in the loop? We’ll give you updates as other B&B news comes in. Stick with the CBS soap and don’t forget to check CDL often for the latest Bold and the Beautiful spoilers, updates, and news. The Bold and the Beautiful Spoilers: Terrible Problems Ahead For Steffy and Liam – Bill is Kelly’s Dad, Hope Pregnant?